The Battlespire was the proving ground and testing facility for the Shadow Legion, the Imperial Battlemages, in the Third Era. This war college was (and it's ruins remain) located in a Slipstream Realm between Oblivion and Mundus, as such a realm allowed mortals to experience and comprehend Oblivion without being driven to madness. More simply, it was possible access numerous realms of Oblivion from the Spire through the use of teleportals and voidgates. The facility was moored in place by five great Anchors, which assured its safety and stability in the surrounding flux. Access to the edifice was granted via the Pillar of Light, a teleportation device linked to the Weir Gate. During the Imperial Simulacrum, the Impostor Jagar Tharn betrayed the Battlespire to the legions of Daedric Prince Mehrunes Dagon. A pair of trainees became trapped inside; one was captured by Lord Dagon, but the other apprentice followed the trail through numerous Daedric gates to Dagon's citadel, where, by a subtle trick, they cast the Daedra Lord into Oblivion. Having lost Lord Dagon's support, Jagar Tharn's plot to supplant the true Emperor was doomed to fail. The Weir Gate is the portal through which the Battlespire was accessed from Nirn, and which also provided a means of return. It's existence was known as far back as the Second Era, though it is unclear if the Battlespire as a whole existed at that time. During the attack on the spire by Mehrunes Dagon's legions, the gate was sealed with a powerful sigil in the shape of the Daedric letter "Hefhed". This meant that no reinforcements could enter the Battlespire from Tamriel, and the battlemages already within were trapped. Aside from the Weir Gate itself, the only access to the colleges was via the Star Galley, a magic boat which could navigate the surrounding environs. The vessel was constructed by Battlemage and Artificer Clarentavious Valisious, and was kept in the Star Galley Crib near the Weir Gate, though access was normally restricted. This section of the facility is notable for being the home of the gigantic Mock Turtle, a member of the rare species of Great Turtle from which is made the famous Mock Turtle Soup, the Soup of Kings. He was known to have "dwell[ed] beyond the Weir Gate" in the Second Era. The upper sections of the Battlespire consisted of the war college itself. Here were found dormitories, mess halls, libraries, and more. Of particular importance was the voidgate. This device, powered by artifacts known as voidguides, allowed passage to Oblivion. 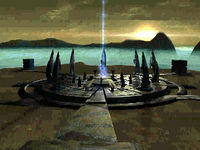 The Soul Cairn was accessed in this manner during Mehrunes Dagon's invasion, but it is not known which other realms the voidgate was able to reach. 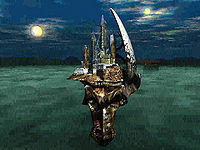 Several realms of Oblivion were known to be accessible from the Battlespire or from each other. These include the Soul Cairn, Shade Perilous, the Chimera of Desolation, the Havoc Wellhead, and Dagon's Hunting Lodge in the Deadlands. During the Imperial Simulacrum in 3E 398, Battlespire was invaded by legions of Daedra in the service of Daedric Prince Mehrunes Dagon. [UOL 1] Imperial Battlemage Jagar Tharn, posing as Emperor Uriel Septim VII, made a deal with Lord Dagon in order to eliminate his enemies. Gaze Upon this Device and its Subtle Workings, and Tremble with Wonder! By the grace and gifts of Clarentavious Valisious, thus the Star Galley is Made Fast and Secured Thereby. lomegan mariel surrendered portal keys, was struck down. Sirran Angada - tharn henchman, disguised as Lomegan Mariel. Paxti Bittor was the traitor. Master of teleportation and voidgates. The invaders were known to wield Daedric Crescents, and succeeded in slaughtering most of those inside. The Empire later reclaimed the ruined Battlespire, and gathered up all the Daedric Crescents to be destroyed, though one is rumored to have survived. þ"...and the Emperor then commanded to bring forth the two champions who had served him so well, who knelt before him and received his blessing. He bid them rise and said to them, '%APF, and %PCF, let all present know how these two have served their Empire, for had not Jagar Tharn been robbed of the support of the archfiend Mehrunes Dagon and his fell minions, then Ria Silmane and her champion might never have revealed Tharn's imposture, and long might the rightful emperor have languished imprisoned in Dagon's dark prisons within the Void.' And he then made them great presents of land and chattels, and raised them up among his counselors, and conferred upon them offices of great importance in his Legions." þ"Reinvestment of Battlespire is neither feasible nor desirable at this time. The open provocation and sweet temptation this installation presents to the Daedric Powers is obvious from recent events, and the installation is of no significant value to the maintenance of the Pax Imperia. In light of recent turbulence in the Border Provinces, and considering more pressing demands upon the treasury, we recommend that the gates to Battlespire be sealed indefinitely." þ"The Emperor questioned %PCF closely. %PCF said that, when struck by the enchanted sword, Dagon appeared to have been sucked away and compressed into an ever-smaller volume, and then to have disappeared. The Emperor then inquired among his counselors how long we might be free of the Prince of Destruction. Their answers were various, hopeful, and unpersuasive. 'You have done all that might be done, %PCF,' sighed the Emperor, 'but Oblivion cannot long hold Dagon, and when he returns, he surely will count us among his most-cherished enemies.'" This page was last modified on 9 November 2018, at 08:57.